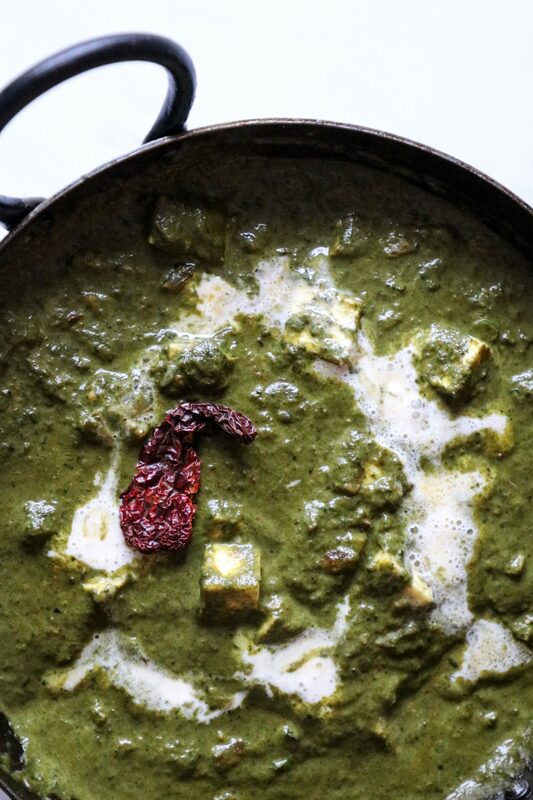 Another yummy Indian gravy for winters is palak paneer. It is one of the all time favourites of punjabis, and it is one nutritious dish with lots and lots of spinach in it. 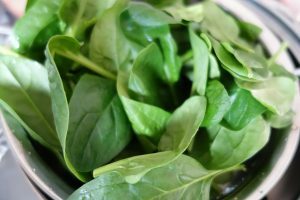 As per some theories the combination of spinach and cottage cheese, is not a nutritious one, as iron and calcium should not be had together, because calcium hinders the absorption of iron.. But really!! Even if this is not the right combination health wise (though I don’t believe it) , we have been having this since childhood and it is one helluva tasty vegetarian dish!!!! and of course we’re not having this everyday.So lets eat it folks ,without any guilt!! 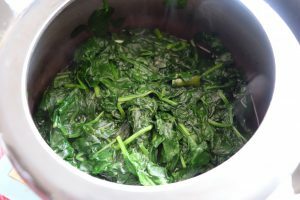 There are different ways to make it, and the recipe that I am sharing is quite a simple one.The steps basically require blanching the spinach leaves with some garlic cloves and green chillies, in salt water for 5-6 minutes and then pureeing them. Then add them to a nice aromatic tempering, adding paneer and cream in the end, to add to the deliciousness of the dish. 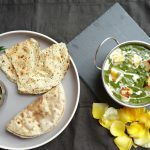 Also the cream helps to cut down the bitterness in spinach.In India, at home my mum uses homemade malai, but here in UK , I usually do not have homemade Malai handy, I use clotted cream or even fresh cream available in superstores. If you do not want to add cream, you can replace this with a little milk. For paneer, in this dish I used the paneer available in superstores like ASDA / Tesco, but you can make the paneer at home, by curdling milk, and seiving it.Later keep it under heavy weight for 4-5 hrs to get a good quality homemade paneer. 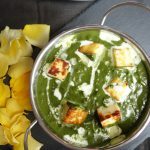 You can use the fresh paneer cut into cubes and directly add it into the puree, or if you want to make the dish more rich, you can just use a little oil, and brown the paneer cubes in a pan/tawa before adding them to the palak puree. Both ways it tastes delicious. The tempering can be made using vegetable oil, or any oil that you use for cooking, but I would really recommend using pure desi ghee for this , as the true flavour of this dish, and as a matter of fact , most of the Punjabi dishes only comes out with using ghee.Believe me ghee is not bad for your health. It is really healthy to add some amount of pure desi ghee in your daily routine.In the ghee ,add dry spices, and onions, tomato, ginger, garlic, green chillies, and then add spinach puree. 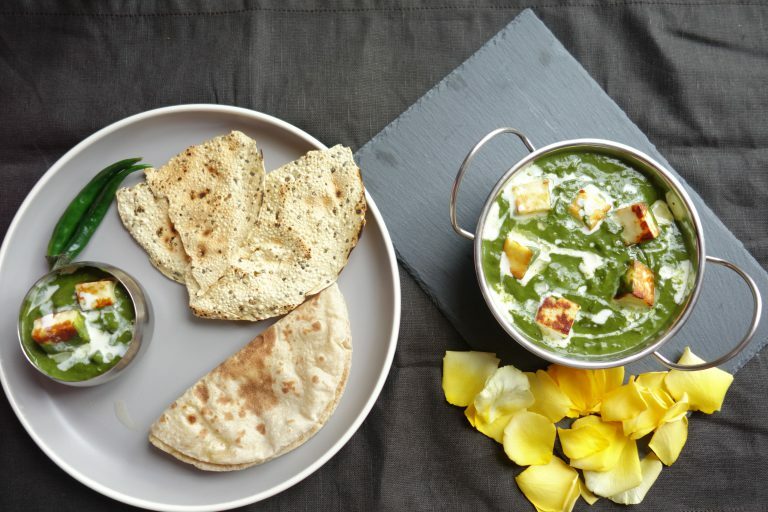 Palak paneer tastes best when served hot with paranthas , roti, naan or poori. 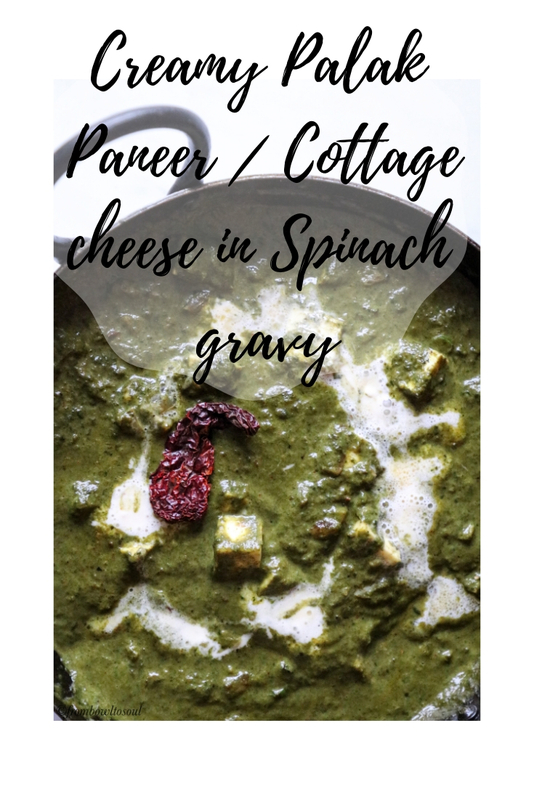 Indian cottage cheese dipped in sumptuous creamy spinach gravy cooked in aromatic spices. 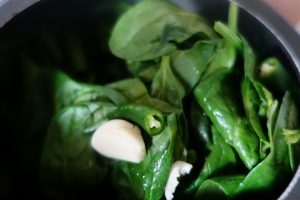 Blanch the spinach leaves/palak leaves along with 2-3 cloves of garlic, 1-2 green chillies,and half a cup of water, in a covered pan for 6-8 min. Add Jeera/ caraway seeds, hing (asafoetida) and let it splutter for a minute. Add Ginger and garlic (grated or paste). If you do not have fresh ginger/ garlic, you can use 2 tsp of ready ginger/garlic ready paste.Saute till the raw aroma of ginger garlic goes away. Add chopped onions. Saute them till they turn nice light brown in colour. Saute the whole tempering well, till you can see oil on the sides. Add salt, red chilli powder, haldi powder(turmeric powder) and chopped green chillies. Add the palak/ spinach puree, and saute well for 5-10 minutes on slow heat. Add 2 tbsp Malai/ fresh cream to the puree. Mix well . Now add the paneer (fried/ or fresh cubes) to the spinach puree.Mix well, and simmer for 5-7 minutes. Turn off the heat. Garnish with fresh cream and serve hot with paranthas/ roti/ naan. If using malai, just whip it for 2-3 minutes to make it smooth. 2. 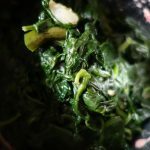 Adding cream/ malai really brings out the richness in this dish, and cuts the bitterness of spinach, so I would really recommend adding it. 3. If you have added water while blanching, you can sieve it before making the puree, depending on the consistency you want.